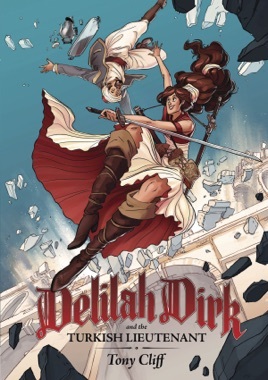 Lovable ne'er-do-well Delilah Dirk is an adventurer for the 19th century. She has traveled to Japan, Indonesia, France, and even the New World. 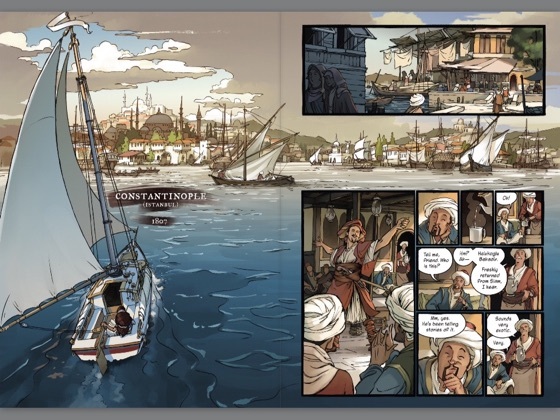 Using the skills she's picked up on the way, Delilah's adventures continue as she plots to rob a rich and corrupt Sultan in Constantinople. 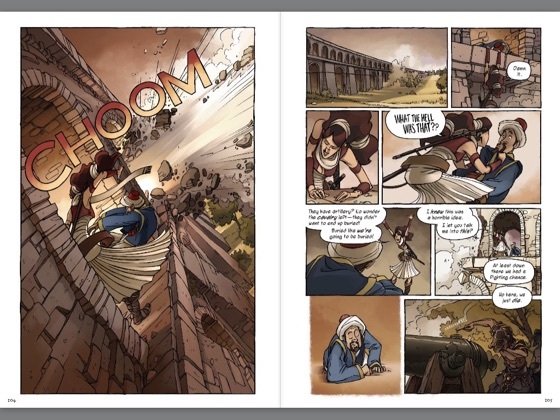 With the aid of her flying boat and her newfound friend, Selim, she evades the Sultan's guards, leaves angry pirates in the dust, and fights her way through the countryside. 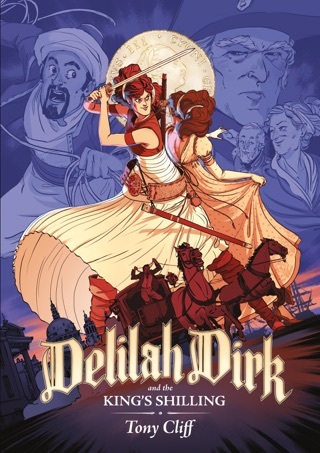 For Delilah, one adventure leads to the next in this thrilling and funny installment in her exciting life. 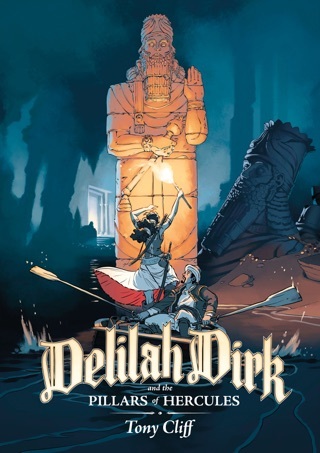 Tony Cliff's Delilah Dirk and the Turkish Lieutenant is a great pick for any reader looking for a smart and foolhardy heroine...and globetrotting adventures. 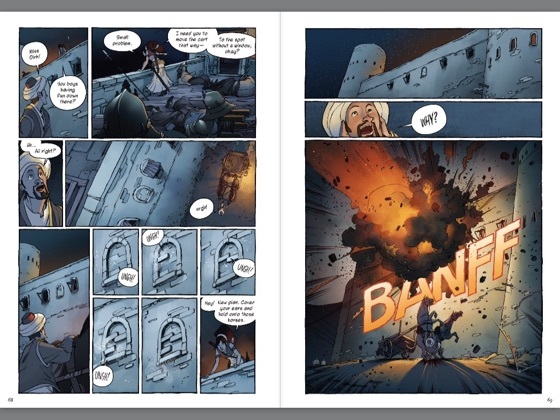 Cliff pulls out all the stops for his first graphic novel, which he originally published online, pairing a wisecracking, death-defying heroine ( Guard! she calls good-naturedly from her prison cell, I m escaping ) with a sensitive minor military official prone to overthinking when lightning-fast action is required ( Jump? Surely not! What about the other options? Are there any other options? ). 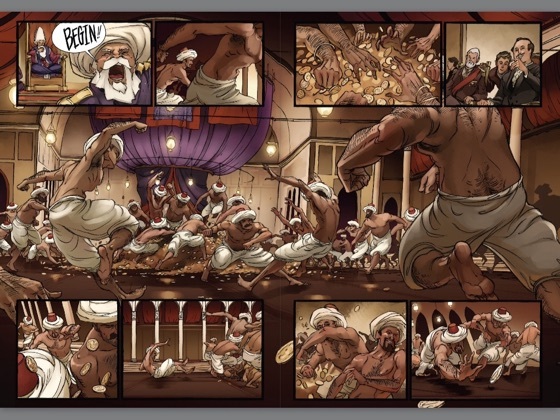 The plot, such as it is, follows Lieutenant Selim as he is dragged willy-nilly into Delilah s life of action and danger when all he wants is a hot cup of tea; really, though, it s a vehicle for blood-pumping episodes of derring-do and heroism involving swordplay, artillery, aqueducts, piles of treasure, tyrannical Ottoman rulers, treacherous officials, and the occasional quiet idyll in Delilah s flying boat. 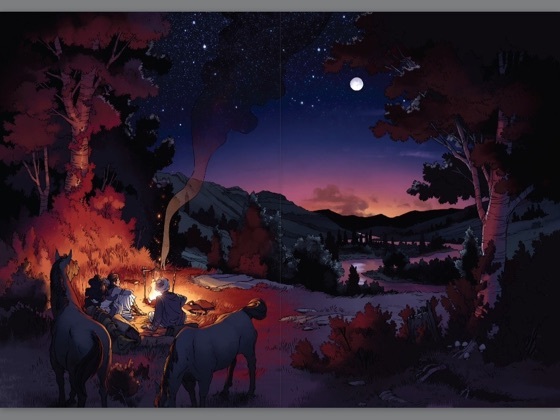 Sunlit landscapes, candlelit interiors, and nighttime explosions give Cliff opportunities to show off his splendid draftsmanship, while the dialogue provides a constant stream of sardonic banter ( Kill me with what? That rope? You ll give me rope burns til I yield? ). Cliff apparently took five years to write this, but fans will hope a sequel doesn t take that long. Ages 12 up.